MBAInternetMarketingManager: One of the Best 100 blogs for MBA Students !! 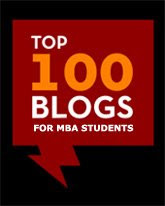 I’m very happy to communicate to all the readers and followers of MBA Internet Marketing Manager that it has been selected by GraduateDegree.org as one of the best 100 blogs for MBA Students. Thank you very much to all of you guys for making this selection possible and keep on the great support you’ve given to this humble blog so far !! Hope to continue to be able to provide you with interesting content, always from the perspective of an MBA trying to survive as an online entrepreneur in the Internet Industry. Outstanding post! I enjoy reading your posts and thank you for all the great articles. I have bookmarked your blog to come back to it and read it more often.